The Chapel of Our Lady of Vitaleta is a small sacred building is located on a hilltop in the village Vitaleta on the road that connects San Quirico d'Orcia to Pienza. From it comes the statue of the Madonna attributed to Andrea della Robbia, now in the church dedicated to her in the center of SanQurico, the statue would be purchased in a shop in Florence in 1553. There are traces of the chapel for the first time in a document dated 1590. The present appearance is the result of restructuring by architect Giuseppe Partini in 1884, inspired by models sixteenth. The Chapel of Our Lady of Vitaleta was placed under protection as a UNESCO heritage site. You will find a Capella di Vileta between Pienza and San Quirico d’Orcia, driving on the Strada Provinciale 146 from Chianciano. It is possibleis to start at San Quirico near farm Belvedere. You can park your car or bike quite easily there. Halfway on the trail you will pass the chapel. 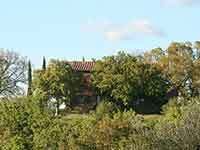 The area of the Valle d'Ombrone incorporates the perfect harmony for man and nature. Podere Santa Pia is a restored farmhouse, appointed with terra cotta tile floors, exposed ceiling beams, where you can spread out, relax, and recharge for the next day of activity. Here you find the perfect vacation rental for your needs and desires. The Castle of Castello di Spedaletto is situated 9 km from Pienza. This medieval fortress is an important example of a many towered and fortified castle. Inside there is a small church with gothic portal and a nice rose window.